Dimensions (HxWxD): 1.25" x 0.5" x 0.375"
These gorgeous, energetically powerful Super Nova cut Tibetan Green Obsidian Gemstone Hanging Earrings come from the banks of the Yarlung Zangbo River. The Zangbo is the highest altitude major river in the world, originating in the Tamlung Tso Lake in Western Tibet, southeast of Mount Kailash, one of the most sacred sites on Planet Earth. 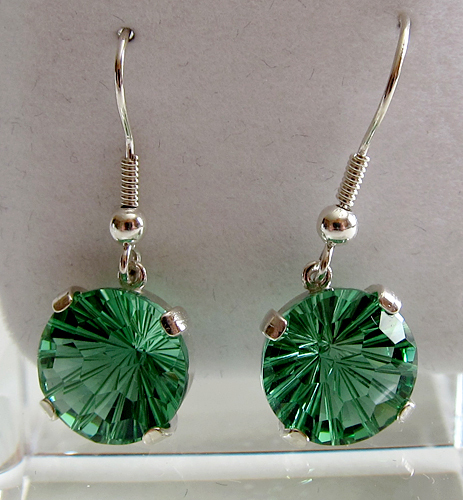 These Tibetan Green Obsidian Super Nova hanging earrings come in a velvet jewelry box for safe-keeping. 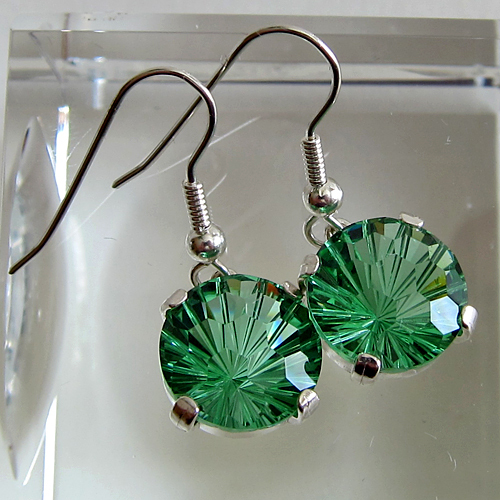 This pair of crystal earrings has been cleaned with Universal Life Force Energy, and given an energy attunement using Reiki, a Japanese technique of energy healing, so it will continue to receive and transmit Universal Life Force Energy direct from the Source of Creation. It has also been cleaned and charged with the natural energy of sunlight. It is ready for you to program according to your own needs and desires. Note: Weight above is shipping weight. Actual weight of this pair of earrings is 4 grams.